The K-Tuned Billet TPS sensor was designed solve all K-series TPS problems. We’ve seen and read about the cheap Asian-made replacement units causing countless drivability problems and failures. In some cases even the OEM sensors have failed prematurely. These problems are exactly what motivated us to design a reliable replacement TPS sensor that won’t fail like the others. Successful and thorough road testing was completed on several cars to ensure that our TPS unit could withstand the vibration associated with semi-solid K-series swap mounts. Our unit is constructed with a quality, American made, Delphi sensor that is encapsulated in a 6061 billet aluminum housing. The housing was designed with a special silicone filled pocket that gives the sensor space to float inside. 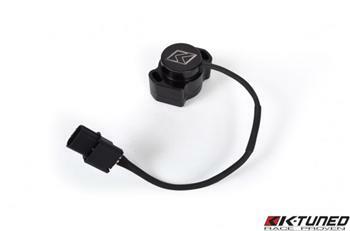 The cured silicone, allows the unit to absorb the engine vibrations that typically ruin other sensors. We are so confident in our sensor that we are even offering a warranty. This TPS unit can be mounted on any K20A/A2 and Z1 throttlebody or the A3 throttlebody only from the Honda EP3 hatchback. The engine must also use KPro or AEM engine management that allows recalibration of the TPS scale. The required recalibration is very minimal and easy to do. Our TPS sensor comes complete with a new gasket, all mounting hardware, plug and pigtail to wire it in and detailed installation and recalibration instructions. If you have TPS problems, this part is exactly what you need.